Goofball activism may be, for most, a fleeting phase of youth, but the dogged Jay Critchley has made a career out of donning odd headwear and presiding, preacher-like, over vaguely politicized rituals. 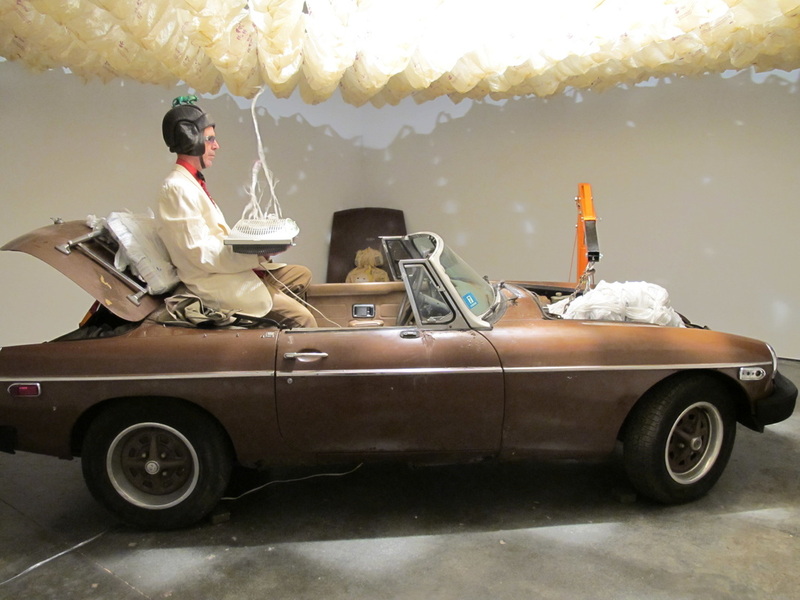 Recalling his sand-encrusted cars from 30 years ago, which mocked our oil addiction, the artist has this time mummified a 1979 MG convertible—a process that involved the removal and wrapping of the automobile’s “organs” and the recitation (by Critchley, wearing a leather helmet) of verses from the Egyptian Book of the Dead. Elsewhere, in his super-low-budget 1988 video NRC—An Atomic Journey, he plays the president of Nuclear Recycling Consultants, proposing various plans (a mall, a cathedral) for the transformation of abandoned nuclear-power plants, where Critchley actually performs more of his nutty benedictions. As in Allan Kaprow’s Happenings five decades ago, the lunacy is so earnest it becomes a raw form of art itself. Not to be outdone, Chad Person has designed a giant, inflatable Underdog—that canine superhero from the 1960s cartoon who always popped an energy pill for strength. Modernized, rebuking Jeff Koons kitsch, the figure slumps next to oversized meds and stares into a smartphone while, before him, a monitor reruns those long-ago rescues of Sweet Polly Purebred. Similar iconic sculptures from Person, like the Big Boy restaurant character, best deliver their satire in photographs taken outside the gallery. It’s surprising, then, that the show does not include one of the artist’s most effective shots — Underdog in a parking lot, absorbed by the phone and oblivious to dense smoke billowing above what appears to be an endangered city. ​Two predictably dystopian takes on conspicuous consumption. Critchley wrapped an MG sports car in plastic bags and fastened several Stop & Shop bags to the ceiling, so they hover above it in a threatening nimbus. It’s an impressive feat, but the message of excess is obvious, to say the least. In an edgier early video from 1988, the artist poses as president of the Nuclear Recycling Consultants and proselytizes about the values of nuclear energy. At one point he dons a clear plastic cape and performs a ridiculous ritual in front of an abandoned power plant. Person’s work challenges capitalist optimism with paintings of epigrams—rendered in delicately curling script—that convey an air of resignation through sayings such as “know when to fold em.” Through Sept. 10.